Two men, including one decked out in a U.S. Postal Service jacket, robbed a Lincoln Park restaurant Thursday afternoon, pressing an object believed to be a gun into an employee’s back, and making off with money and the worker's iPhone. 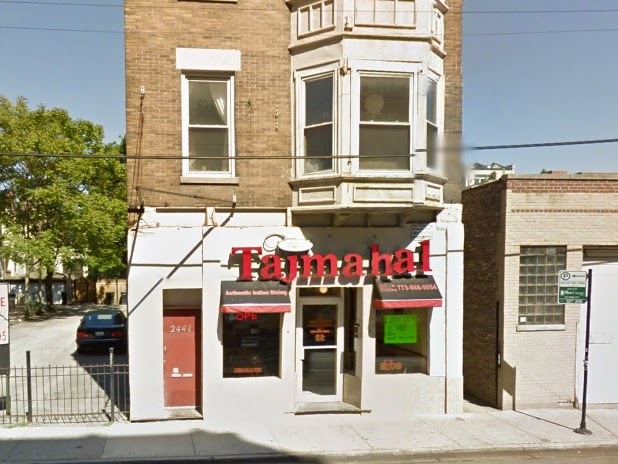 After robbing the sleepy Taj Mahal restaurant near Halsted and Fullerton around 4:20PM, both offenders fled eastbound through a gangway and disappeared. Cell phone tracking indicates that the victim’s phone soon found its way to Adams and Wabash, then quickly proceeded south of 35th Street. Neither the offenders nor the stolen goods have been found. 2) Male, black, 35, 6’ tall, 160 pounds, wearing a brown jacket and yellow t-shirt. The restaurant hold-up was the second apparent armed robbery reported in that immediate area on Thursday. Earlier, a British tourist flagged down an officer to report that he had been robbed at gunpoint as he walked near Fullerton and Clark. Following two armed robberies on a single day this summer, Lincoln Park Alderman Michele Smith held a police “roll call” on a quiet side street to “send a message” to criminals that armed robberies will not be tolerated on her turf. The criminals did not attend.